The Washington Post‘s Fact-Checker wrote that Rep. Ilhan Omar's (D., Minn.) glib remarks referring to the September 11 terrorist attacks called to mind George W. Bush's famous bullhorn speech at Ground Zero. Glenn Kessler dove into the controversy surrounding the freshman lawmaker's speech last month before the Council on American-Islamic Relations. A snippet went viral where Omar appeared to glibly refer to the worst terror attack in U.S. history as "some people did something." "Here's the truth. For far too long we have lived with the discomfort of being a second-class citizen and, frankly, I'm tired of it, and every single Muslim in this country should be tired of it. CAIR was founded after 9/11 because they recognized that some people did something and that all of us were starting to lose access to our civil liberties," Omar said. "So you can't just say that today someone is looking at me strange and that I am trying to make myself look pleasant. You have to say that this person is looking at me strange, I am not comfortable with it, and I am going to talk to them and ask them why. Because that is the right you have." "We will leave it to readers to determine whether Omar should have referred to ‘terrorists' or if the context for ‘some people' is clear from the speech," Kessler wrote. He went on: "When we listened to the whole speech, we were reminded of President George W. Bush's phrasing in two famous moments after the Sept. 11 attacks." Speaking amid the rubble of the World Trade Center three days after the attacks, Bush said, "I can hear you! I can hear you! The rest of the world hears you! And the people—and the people who knocked these buildings down will hear all of us soon!" Bush's use of the word "people" appeared to be the main tie between his and Omar's comments, in the eyes of Kessler. He also quoted Bush's remarks on Sept. 17, 2001 at the Islamic Center, where he said Muslims made valuable contributions to the U.S. and shouldn't be harassed amid anger over the radical Islamic ideology of the 9/11 perpetrators. 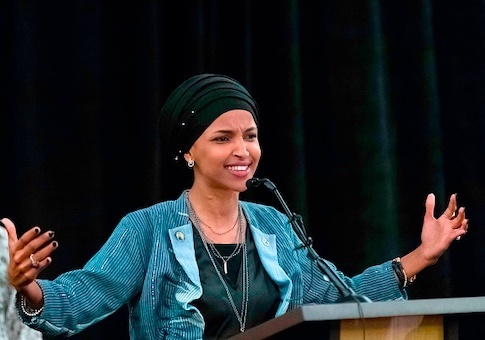 Omar has come under fire several times in less than four months in office, including for making repeated anti-Semitic remarks about Israel and its domestic supporters. Omar was incorrect to say CAIR was founded after September 11, 2001. The organization was founded in 1994. Kessler referred to CAIR as an "aggressive Muslim civil liberties organization" and noted it was unindicted co-conspirator or joint venture in a 2008 case against an "Islamic charity that in 2008 was convicted of funding Islamist militant groups." CAIR also has links to the terrorist groups Hezbollah in Lebanon and Hamas in the Gaza Strip. This entry was posted in Issues and tagged George W. Bush, Ilhan Omar, Media Bias, The Washington Post. Bookmark the permalink.